Small, but well-organised rallies are occurring in China to demand the release of young female labour activist Shen Mengyu who was taken from her parents by three unidentified males in Shenzhen on Saturday August 11. Shen (left) is a graduate in mathematics and computer science, but took the path of integrating with the working class and organising them in fights for their rights at work. (Her t-shirt reads "Unity is strength"). 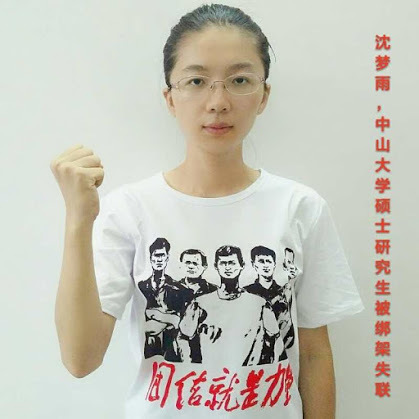 Her arrest follows the case last November when five young students, members of a Mao Zedong Thought study group, were arrested in Guangzhou Province. “NHK mainly produces springs used on engines and clutches for car companies such as Honda and Nissan. After some brief training, I walked into the workshop for the first time. The roar of machines stung my eardrum, the smell of oil blew on my face, and metal dust filled the whole workshop. The working area was oily and shiny, and workers in it were busy and strained. The hazard sign of benzene and other chemicals made me nervous. Workers only wore disposable masks, which could neither effectively block dust nor filter toxic gases. Some of them even didn’t wear masks. After listening to the workers, Shen was able to formulate a set of demands to be raised in 2018 at collective bargaining sessions. Despite opposition from the tame-cat company union, Shen was elected by the rank and file to a nine-person negotiating team. That was on April 13. On May 28, she was sacked by the company and its union. However, the NHK workers dared to continue their struggle and by June had won a substantial wage increase, an improved annual bonus and management contributions to a housing provident fund. Shen Mengyu established a WeChat online platform to publicise the successful struggle and took NHK and its union to court, although she lost the case. She then took up the case of workers at a privately-owned (US-based) welding company in Shenzhen, Jasic International. Workers in Australia might be familiar with their Chinese-made welding equipment. She encouraged them to set up their own union. Protests at the Jasic factory broke out in early July after seven workers involved in attempts to establish the union were laid off. On July 27, after two weeks of protests, the police detained 29 people, including laid-off workers, their families and supporters. Hundreds of Chinese university students penned open letters on social media in support of the workers, and around 50 travelled to Shenzhen to rally outside the factory. Shen Mengyu took an active stand in helping to organise the workers and their supporters. However, on August 24, in an early morning police raid on their rented accommodation in the city, police detained more than 50 of the student supporters. The kidnapping of Shen Mengyu, and the arrests of student supporters has seen protests by retired workers and cadres, small in number, but widespread across China. 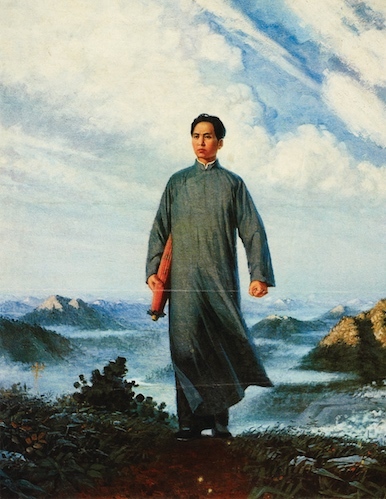 Remembering a young activist who had gone to organise the coal miners at Anyuan in Hunan Province in 1922 and 1923, many held his portrait at the rallies calling for the return of Shen Mengyu. Integrating with and helping to organise the workers is a very high ideal, particularly for young intellectuals, embedded in Marxism and in the history of the revolutionary movement in China. No matter what honeyed words about Marxism drip from the mouths of senior leaders in China, Shen Mengyu has shown that what really matters is what happens on the ground. After the long drought of capitalist restoration inflicted on the Chinese working class, it may well be significant that Shen’s given name “Mengyu” translates as dreaming of rain. A flood of struggle is bound to be unleashed if the authorities continue to repress workers and their allies.